In Ontario, Canada, the traditional age for retirement is 65, but people beyond this age may opt to continue working. However, according to writer Ellen Roseman of TheRecord.com, in Waterloo—whether people choose early or late retirement, they have to make important retirement decisions first. “How will your age affect your monthly payment? Once you have all the numbers and have a rough idea of what you can expect you can then identify any areas that need to be beefed-up. There are some very good options and products offered by some of the major insurance companies in Canada that can be a crucial part of your retirement planning. A quick google search of “online life insurance in Toronto” will quickly lead you to the information you need. Most people only think of life insurance as being there for the “what-ifs’ in life and often buy term insurance to fill this need but there are policies and insurance products that are designed with retirement in mind. Financial experts, however, stress that before people choose a life insurance package to help fund their retirement, they have to become familiar with the various types of life insurance first. Term insurance is available for fixed periods typically, 10, 20 and 30 years and pays the death benefit to the beneficiaries when the insured person dies. Term insurance in Toronto and elsewhere is a great option for young families as it is very reasonably priced and can often be converted to Permanent Insurance without having to be re-approved medically. So buy it when you are young and healthy! Unlike term, Permanent life insurance is insurance coverage that stays with you for your entire life. Premiums don’t increase and there is usually a cash component and many options for getting at those funds in retirement. Annuities are another great product that can guarantee a monthly payout that will remain until a person dies. 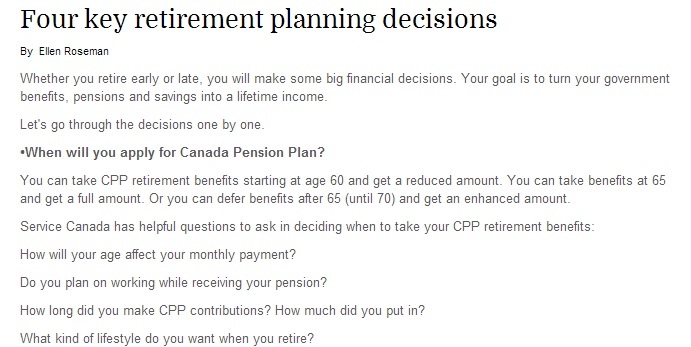 Converting your existing RRSP to an annuity is something really worth looking into. Annuities can provide a fixed monthly payout regardless of the stock market swings or how long you live. This makes for a very stress free retirement. Reliable, licensed insurance brokers like InsuranceAdvantage.ca can steer retirees or future retirees in the right direction so they can choose the ideal product offered by the major life insurance companies in Canada that suit their unique needs and budget.